Bradley (b. Iran) is sound artist, composer and arts-broadcaster who works with listening, language and the environment to question our sense of self and our place within the society and nature. Bradley’s practice spans performance, broadcast, installation and sculpture, and revolves around experimental music, listening and exercises in modes of communication. Bradley’s sculptural works employ treated found objects, textiles and electronics, while live performances overlay architecture, public space and history. Often centered around sculptural installations, Bradley’s research-based practice, also involves collaborations, from performing with noise improv quartet Oscillatorial Binnage from 2016-2013, into the sound-art duo Bradley-Weaver, working together with Christopher John Weaver in the Middle East since 2013. Read a review of their solo show Systems for a Score, in Artslant. In 2013 Sound and Music, the leading body for sound art and experimental music in the UK, awarded Bradley a year’s residency in cine-film studio no.w.here, (London) and her practice, which also includes curating and a wide range of media and art teaching, then consolidated over four years working in the UAE and around the Persian Gulf, (Bahrain, Kuwait and Pakistan) as solo shows and a series of Bradley-Weaver sound art exhibitions, pedagogical projects and experimental musical performance commissions. Bradley is now working part-time studying for a practice-based PhD in Sound Art the London College of Communication (LCC), University of the Arts (UAL), London. Broadcasting on UK’s experimental arts-radio station Resonance104.4fm since 2004, Bradley has performed live-improv and composed graphic scores both solo and for the Resonance Radio Orchestra for live radio and public performance (e.g. London Architecture Biennale, Gasworks, London). Her weekly radio programme Six Pillars, live broadcast on 104.4FM, is on Middle Eastern, North African arts and culture. For seven years her show on experimental dance music: Free Lab Radio, ran simultaneously. Bradley has conceived and produced several pop-up radio projects, such as Falgoosh Radio at Art Dubai (2013 and 2014), Jaou Tunis, Tunisia (2014 and 2015), South London Gallery (2014). Radio commissions include a broadcast sound walk for MonaFoma 2018, at The Museum of Old and New Art, (Tasmania) and the radio performance Petrosubjectivity, for Radio Revolten, Halle, Germany. Connected to her series Free Lab Radio on Resonance104.4FM, Bradley has DJ’d experimental dance music and fringe genres in unlikely venues from museums (e.g National Portrait Gallery, ICA London) to art galleries and international music festivals such as Glastonbury, Exit Festival (Serbia) and Bestival (Isle of Wight), as well as on moored boat installations (Venice Biennial for the Danish Pavilion), specialist conferences such as Cafe Oto’s Daphne Oram symposium, playing her unheard and unreleased recordings, and art openings such as Sharjah Biennial, UAE (2016) and London squat parties such as Area 21, Peckham (2011). On air Bradley has interviewed a gamut of great names in the fine arts, music and film such as: Yinka Shonibare OBE, Charlie Dark, Acid Man, Mr Scruff, Egyptian Lover and many more. Designed to provoke active listening, Bradley has exhibited sculptures, installations and text-based textile works about sound in galleries such as Maraya Arts Centre (Sharjah), The Mine (Dubai), Tashkeel (Dubai) and in group shows at Strange Cargo Gallery (Folkestone), The Art of Nuisance exhibition for Sisters of Perpetual Resistance (London), Raven Row (London) and Prince’s Galleries (Shoreditch, London). With an interest in materiality, Bradley has worked with electronics, sound objects and textiles to create works for solo and group shows to examine language, the act of memorising and human self-perception. Her work has appeared at Raven Row (London), Sight and Sound Festival (Folkestone) and The Mine (Dubai). As sound-art duo Bradley-Weaver, with Chris Weaver, Bradley’s sculptural and installation works investigating materiality, architecture and history were featured in solo and group shows internationally. Artist commissions included Al Serkal Avenue, Sharjah Government (Leffayeh Wildlife Centre), D3, Design District, Dubai, Art Dubai 2015 (performance and installation), Quoz Fest (Dubai) and the International Symposium of Electronica Art 2014 (UAE), the pop-up radio station Falgoosh Radio, (an arts-radio installation at Art Dubai 2013 & 2014) an experimental platform for arts-discussion and field-recording. Together Bradley-Weaver have broadcast in pop-up radio stations at MIMA (Middlesborough Institute for Modern Art) for AV08, Frieze Art Fair 2006-2010 inclusive, at the Serpentine Gallery for Ririkrit Tirivanija’s solo show and a UBS weekend at Tate Modern for Resonance104.4FM. Bradley-Weaver’s work also employs live, experimental music performance, commissions include Circular Landscapes an evolving series of performances for the Maraya Arts Centre, Al Qasba Theatre (Sharjah) and Al Serkal Avenue (Dubai), Sikka Art Fair (Dubai), The Mine (Dubai), Void Gallery for the European Capital City of Culture (Londonderry, N. Ireland), ReUse Kuwait and more. The limited edition artist-vinyl record, Systems for a Score, was made during a live installation during their solo show at Tashkeel (Dubai) is online at The Vinyl Factory, UK. Together Bradley-Weaver also produced an experimental radio series for the Sharjah Art Foundation on radio history in the UAE, which featured on Clocktower Radio (New York) and in October 2018 on BBC Radio 4 Xtra (UK). Bradley’s research has led to presenting as an artist, and as Bradley-Weaver, at academic conferences and arts symposiums: Animal Utterances (Bristol University), LOMA conference, Points of Listening and guest lectures (London College of Communication), Suden Radio (Villa Romana, Florence), Beirut Arts Centre (Lebanon), Redbull Radio Basscamp Dubai, Haus der Kulturen der Welt (Berlin), The American University Dubai, Indus Valley School of Art and Architecture (Karachi), REuse Kuwait, Habib University, (Karachi) and New York University Abu Dhabi, Share Conference (in Belgrade and Beirut, and under other names in Tunisia and Croatia). Making electro-acoustic, experimental improv, Oscillatorial Binnage has featured in The Wire music magazine’s Under the Radar compilation release and performing at Cafe Oto (London), Merge Bankside Festival, Wellcome Trust, Tate Modern and more. Composer commissions include for the Resonance Radio Orchestra at London Architecture Week and the Victoria and Albert Museum and bespoke pieces for the South London Gallery, ICA London, Frieze Projects, The London Mela 2010 and 2011. Performances include the Wapping Project (London), Club Integral (London), REuse Kuwait, Sikka 2014 (Dubai), Noise of the Middle East, NYU (Abu Dhabi), London Mela and many more. 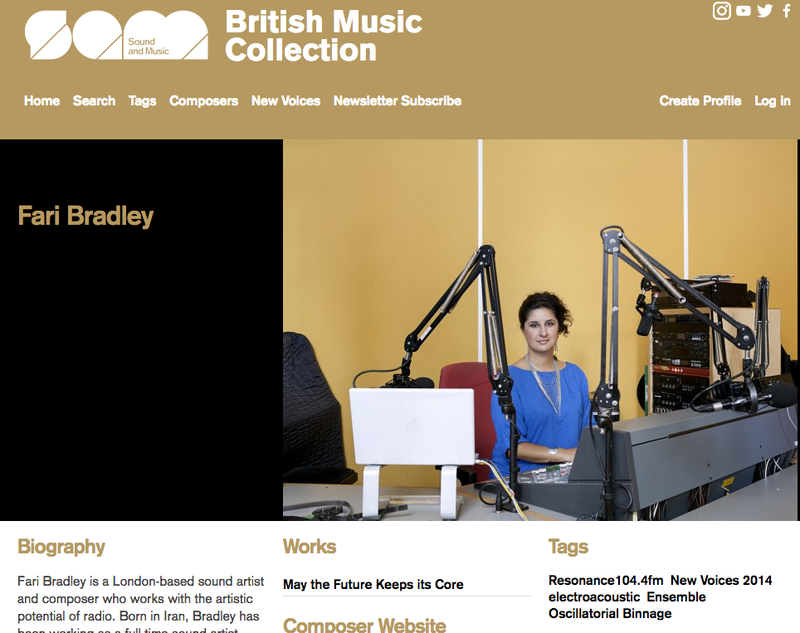 A full composer profile is listed on The British Music Collection. A series of artist’s residencies, such as an Embedded Residency for a cine film installation using crude oil on Iranian home movies from the 1970s, awarded by Sound and Music, UK’s body for sound art and composition and hosted at n.o.where studios (London). Other residencies were with Chris Weaver, and include the Lahore Biennial Foundation (at Habib University, Karachi), New York University Abu Dhabi, Maraya Arts Centre, Sharjah Art Foundation, Beirut Arts Centre, and Malja Studios, Bahrain. Oxford Handbooks (2019), The Wire magazine, Ibraaz online, Canvas Magazine, Brownbook Magazine and Arte East. Read more about Bradley’s experience on Linkedin.